This week in keeping with Breakfasts I present to you the ‘healthy’ hash and egg combo. Like I said, I don’t get excited about lunches but breakfasts are a whole other story. I like making big breakfasts for family or friends and hosting brunches when I can. We had a big Mothers Day Brunch last year at our house. These eggs would be the perfect brunch item because they take no time to prep, and you can cook lots at once. Those who know me well know I don’t really know how to cook and prepare eggs. Besides the basic scrambled eggs or hard boiled I haven’t really mastered any other egg techniques like poached, fried, over easy, medium etc. Probably because I don’t eat them often. Whenever I try to make eggs they get really messy, or cook too fast/not enough. However, I tried the ‘egg in the basket’ routine with a slice of bell pepper (its been done, I know) and it really worked well. I also have an egg allergy to undercooked eggs – the type with the runny yolk centre. The more well-cooked it is the better on my stomach. I remember my dad making us huge omelettes for dinner and feeling nauseous afterward without knowing why – not to mention it was also laden with cheese (another allergy). This makes for easy cooking and serving – they stay neat in their little pepper slice nest and cook over medium heat. The tops look ‘runny’ but when I cut into them the underneath was almost like a hard boiled egg – my favourite. 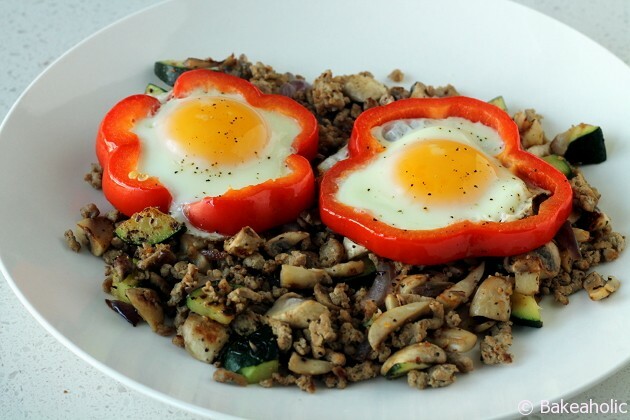 Besides the easy cooking method of these eggs, they make for a pretty presentation – they remind me of a flower. You can make several at once and serve them up for a large crowd. With Mother’s day and Easter coming up they would be easy and delicious. 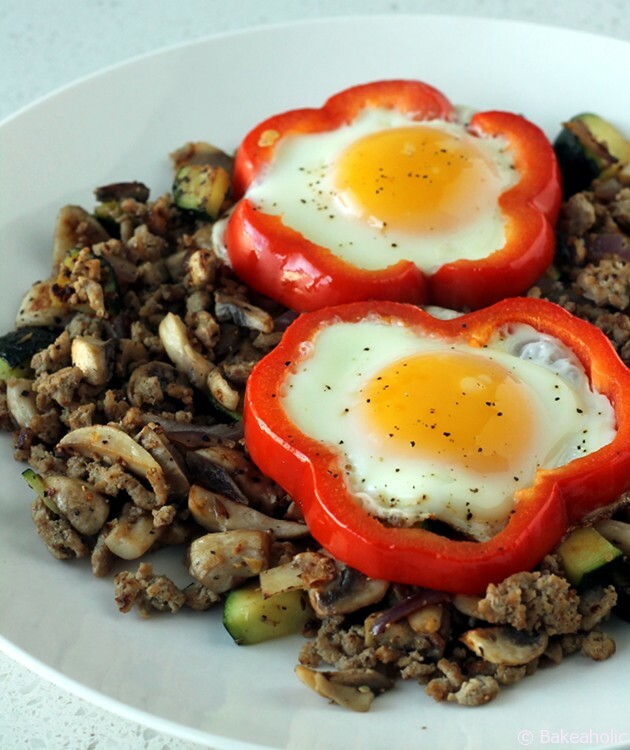 Easy to prepare eggs and a healthier hash for breakfast or brunch. In medium sized pan over medium heat add coconut oil/olive oil along with the diced onion, zucchini and mushrooms. Sauté until vegetables are soft about 6-10 minutes. If you desire, add in the cooked turkey and mix together. Continue cooking for another minute. While the vegetables cook heat a second pan over medium heat and add coconut/olive oil. Place the rings of bell pepper down on the pan and cook 4-5 minutes per side. Once both sides have cooked slightly, crack an egg in the middle of the ring and continue to cook another 5 minutes - depending on how well done you like your eggs. 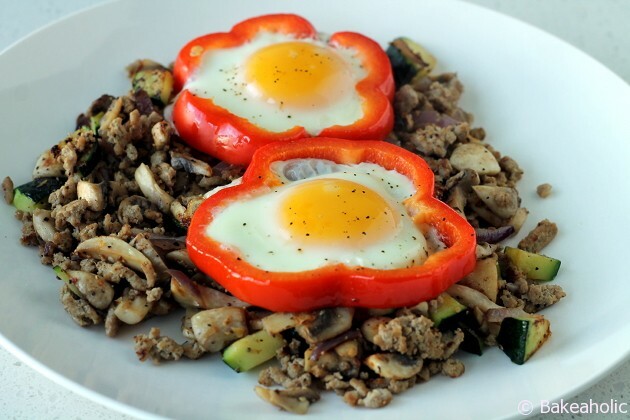 Serve egg and bell pepper over top of the vegetable hash.